Oh, you know how much I love my tie-in novels. Even though I’ve had no experience with the Deadlands RPG personally, the prospect of a story based in a fantasy western world is something that I just can’t resist. As a bonus, this book is also penned by none other than Seanan Mcguire, who will undoubtedly do the Weird West horror setting justice. And the best part is, like the other books in the series, it’ll be a standalone. 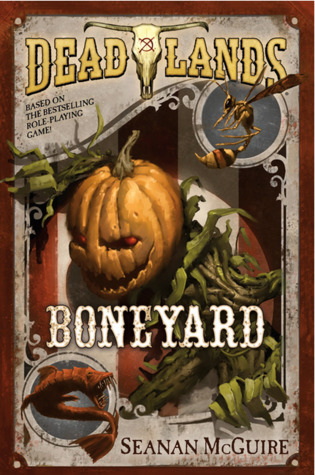 “The newest book based on the hit Weird West RPG franchise Deadlands! Seanan McGuire and Weird West? Wow that sounds fun. That is a really great cover for a book…love these evil looking pumpkin covers! Sadly I’m not a fan of this author so I wouldn’t read it but I look forward to hearing your thoughts on it when you get it! OOoh interesting pick! The cover is eyecatching in a creepy kind of way! Lol! I love this cover and like Tammy, I’d read anything McGuire puts out. I wonder if you have to read the previous books for this one to make sense. I think my husband has played this game at some point, but I don’t remember the details. Nope, this will be the third book in the Deadlands sequence but all three contains a different story with different characters and a different setting, or so I’m told! Oooo, Seanan McGuire! That name sounds SO familiar. I’d not seen this book before though – what a retro-looking cover! Very neat. I hope you enjoy this book when you get the chance to read it! She’s a pretty big name in urban fantasy and the SFF genre as a whole, because so many of her books have won or been nominated for many prestigious awards. Pretty cool that she’s writing an RPG tie-in! I really like McGuire so this is great news – and look at that cover, perhaps a little busy, but I still love it. Yeah I agree, I think it’s going for the Old West wanted poster feel, but there’s way too much going on there!